Goal of this Read-a-Thon: To read as many library books as possible. Rachael's not going to be picky, if you want to read your own books go ahead. (Good thing, I've got a huge TBR pile in my library. some of these have been checked out long enough that I can't renew them or they have holds. Thank you for joining again Gina. I have heard many good things about Ready Player One. You will have to tell me what you think. I hope you are able to complete your goals this week. I know you're going to be busy a lot and on vacation during my read-a-thon in July. No worries...participate when you can. Planning to be mostly unplugged . . .
Wicked Wildfire Read-a-Thon has Started! The Once Upon a Read-a-Thon is coming! 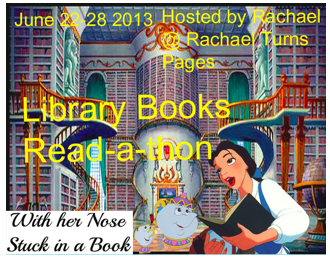 The Library Books only Read-aThon is coming!